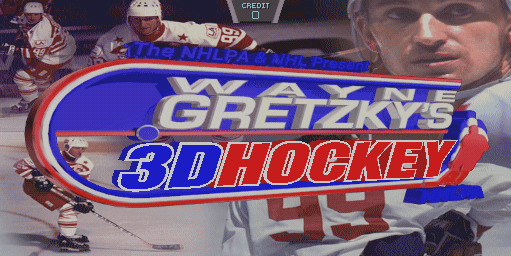 Wayne Gretzky's 3D Hockey © 1996 Atari Games Corp.
A cutting-edge 3-D hockey game for up to 4 players. Features input codes for stats tracking, 2 levels of Cup play, time-released secrets, and player contests with prizes from Atari. 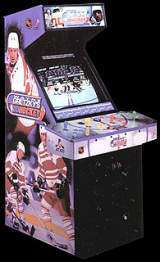 Wayne Gretzky's 3D Hockey was released in October 1996. This game is an official licensed product of the NHL (National Hockey League) and the NHLPA (National Hockey League Players Association). During the match, you can see in the background adverts for 'Coca-Cola', 'Upper Deck', 'Campbell's' and 'Chunky'. Wayne Douglas Gretzky (born January 26, 1961 in Brantford, Ontario, Canada) is generally regarded as the greatest hockey player of all-time and is nickname 'The Great One'. He began playing organized hockey at the age of 6 and by 10 he scored 378 goals and 139 assists in just 85 games with the Nadrofsky Steelers. He entered the WHA (World Hockey Association) on June 12, 1978 and the NHL the following year. During his career, he won 4 Stanley Cups with the Edmonton Oilers, broke many scoring records and was the league's MVP 9 times. He was also the first player to score over 200 points in a season, a feat he accomplished 4 times. 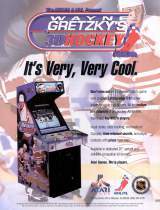 Gretzky retired from hockey in 1999. In his last game playing for the New York Rangers against the Pittsburgh Penguins on April 29, 1999, he recorded his 2857th point in his 1487th game and retired with 894 goals and 1963 assists. He is the first and only NHL player to have his jersey number (99) retired league-wide, meaning no player will ever again wear the number 99 again. Nintendo 64 (1996) : features Arcade and Simulation modes.